After feeling thoroughly deflated and depressed at the state of modern American action movies after enduring both The Equalizer 2 and Skyscraper, along comes Mission Impossible: Fallout, to comprehensively prove that grandly entertaining Hollywood film-making isn’t dead just yet. Set two years after Rogue Nation, the story quickly clicks into gear, as IMF agent Ethan Hunt (Tom Cruise) is given information about an imminent deal involving the selling of plutonium, which will be used by a secret organisation known as The Apostles, led by the mysterious, unseen John Lark, to create weapons of mass destruction. Assisting Hunt are his regular cohorts, Benji Dunn (Simon Pegg) and Luther Stickell (Ving Rhames), but when they attempt to acquire the dangerous substance, things go horribly wrong, and the case containing the plutonium is taken by persons unknown. This then sets off a series of events, involving Hunt’s team (sans Jeremy Renner this time), which is overseen in Washington by Alan Hunley (Alec Baldwin), and his fellow CIA rival Erica Sloan (Angela Bassett), who forcibly inserts her own agent, August Walker (Henry Cavill), into the IMF outfit. Literally dropped into Paris, Hunt and his colleagues will have to first try and identify Lark, then stop him and The Apostles from obtaining the plutonium, while also preventing the escape of Solomon Lane (Sean Harris), the head of The Syndicate who also wants to destroy the current world order as we know it. Added to all that, is the frequent interference from MI6 agent Ilsa Faust (Rebecca Ferguson), who is following her own secret agenda, creating numerous headaches for Hunt and company. 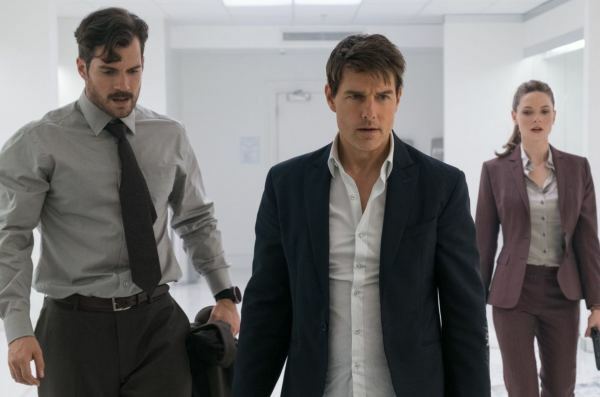 Mission Impossible: Fallout pulls out all the stops to deliver high octane, jaw-droppingly impressive entertainment, with caution and logic thrown to the wind from the very beginning. There is an electrifying, uninhibited attitude that harks back to action films of the late 80’s and early/mid 90’s (like Lethal Weapon 2, The Last Boy Scout, and The Long Kiss Goodnight, but without the R-rated bloodshed and profanity), which featured hair-raising stunt work that frequently left movie-goers both dazzled and exhausted. The exceptionally staged and executed set-pieces here are truly eye-popping, and even when sequences do require cutting edge CGI, the results are practically seamless, never muting or undermining the mayhem happening on screen (a major problem that occurred throughout Skyscraper). This is certainly worlds away from the original 1966 TV series, and even Brian DePalma’s wonderful 1996 feature (which still offers up some outstanding set-pieces of its own). Everyone in the cast attacks the material with suitable exuberance, always in tune with the playful, super-charged tone that is in place from start to finish. Cruise seems to have found his inner Jackie Chan in the last ten years, and with this franchise in particular. The recent Mission Impossible sequels always seem to re-energise the legendary star, and the boundless displays of athleticism and energy bely the fact that he is 56 years old. Completing so many stunts himself crucially makes what is an absurdly convoluted adventure appear convincing, at least while the story is playing out. Pegg is once more a welcome addition to the team, providing much of the comic relief that acts as a nice safety valve between all the intense encounters and destruction that proliferate throughout the movie. Rhames offers another relaxed performance; Baldwin enjoys himself immensely as Hunley, as does Vanessa Kirby as an arms broker known as the White Widow; Ferguson carries over her good work from Rogue Nation; and it’s always great to see Bassett on screen. Cavill absolutely looks the part as Walker, and his stoic character suits his limitations as an actor. It is a little distracting however seeing that moustache which caused so much trouble on the Justice League reshoots. A special mention has to go to Liang Yang, a renowned stunt performer who has amassed an impressive body of work since 2008 (Skyfall, Rogue Nation, The Last Jedi, Pacific Rim: Uprising to name a few), and appears in arguably the film’s most memorable action highlight, where he takes on Hunt and Walker in a nightclub bathroom. He may be in only one scene, but it is one of the best hand-to-hand fight scenes seen in a film outside what one would experience in a first-rate Asian action extravaganza. One hopes this is not the last we see of this imposing, lightning-fast expert. Christopher McQuarrie, who helmed Rogue Nation, improves leaps and bounds with his second entry in the series. While the last film was enjoyable, it seemed to keep the viewer at arm’s length, and Harris’ presence wasn’t fully utilised, making Lane a somewhat underwhelming villain. Fallout, on the other hand, is an overwhelmingly immersive and visceral experience, with McQuarrie’s screenplay filled with old-fashioned spy intrigue, and lovingly flavoured with crosses, double crosses (and so on) that only add to the fun. While his under-rated effort The Way of the Gun (2000) cleverly subverted the action film, McQuarrie now proves he can craft large-scale excitement with the best of them, and a brilliant technical crew ensure that his vision is expertly brought to the big screen. For maximum impact, this should be viewed on the huge IMAX screen, where almost forty minutes of action will be screened in that format. Mission Impossible: Fallout should deliver an exhilarating fix for action fans, especially those who were bitterly disappointed in recent misfires such as the aforementioned The Equalizer 2 and Skyscraper (Rampage, Death Wish, and The Commuter also come to mind). Overflowing with energy and style, and crammed with some of the best action sequences witnessed in a Hollywood film in a very long time, this is one of the few franchises that seems to be improving as time goes on (quite an achievement, after the abysmal Part Two and blandly forgettable Part Three), and has me saying something I never thought I would. I can’t wait for Part Seven.